WILLEMSTAD, CURACAO--(Marketwire - Jan 26, 2012) - Continuing to set the standard for the ultimate in relaxation and hospitality, the Renaissance Curacao Resort and Casino, a premier resort in Curacao, welcomes the island's first Starbucks coffeehouse and the opening of Okeanos Spa. These new amenities now join the long list of reasons travelers find the Renaissance Curacao Resort & Casino an exciting destination, whether taking to the island for a romantic vacation or inspiring business conference. 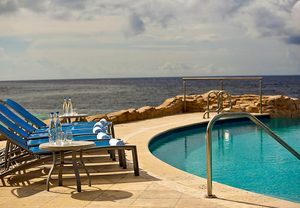 A sophisticated choice among hotels in Willemstad, Curacao's capital city, the Renaissance resort is built around the historic Rif Fort and offers a private beach club, the exciting Carnaval Casino and some of the city's most exclusive shopping and nightlife venues. Now, while surrounded by serene tropical ocean views, guests can enjoy the international flavors of the Starbucks Experience seven days a week and relinquish their mind, body and soul to the attentive confines of the Renaissance Curacao Resort's rejuvenating new Curacao spa. So whether seeking the smooth and aromatic flavors of the finest quality Arabica coffee or the relaxing signature treatments and services of a tropical spa, guests will find these amenities and so much more just a few steps from their door. Reflecting the spirit of the island, signature treatments at the all-new Okeanos Spa, located inside the adjacent Rif Fort, include the Sea to C Facial which combines seaweed and Vitamin C with orange extract and a marine mineral mask; the Mystic Escape Glow Body Wrap of exfoliating sea salts and mandarin orange, grapefruit and lavender oils, and the Turn Back Time Wrap packed with anti-aging vitamins and mineral combined with tropical fruits. For the ultimate in relaxation, Cabana ocean-view massage packages are available at this Curacao luxury resort's Infinity Beach Club and may be embellished with lunch and champagne for a distinctly memorable experience. Providing guests delightful Caribbean atmospheres, guests can opt for relaxing poolside or at the beach, experience the vibrant energy of one of the most exciting Curacao casinos, or wander through the remarkable historic setting of Rif Fort and the Renaissance Mall, where exclusive shopping opportunities and outstanding cuisine are surrounded by the mystic designs of days past. Impeccable guest accommodations include a variety of spacious guest rooms and well-appointed hotel suites, many with large balconies and all designed to provide travelers with an unsurpassed tropical ambiance. Concierge services are also available for added hospitality services. The Renaissance Curacao Resort & Casino welcomes travelers with gracious amenities and sophisticated accommodations while surrounding them authentic Caribbean charm and uptown energy. Situated to provide inspirational ocean views and relaxing island experiences, the Renaissance boasts 8,600 square feet of flexible event space and offers the opportunity for private beach destination weddings and stunning outdoor meeting facilities surrounded by the historic Rif Fort.